Hakuin Ekaku (白隠 慧鶴 Hakuin Ekaku, 1686-1769) was undoubtedly one of the most influential figures in Japanese Zen Buddhism. He transformed the Rinzai school from a declining tradition that lacked rigorous practice into a tradition that focused on arduous meditation and koan practice. Essentially all modern practitioners of Rinzai Zen use practices directly derived from the teachings of Hakuin. At the age of fifteen, he obtained consent from his parents to join the monastic life, and was ordained at the local Zen temple, Shoin-ji. When the head monk at Shoin-ji took ill, Hakuin was sent to a neighboring temple, Daisho-ji, where he served as a novice for three or four years, studying Buddhist texts. While at Daisho-ji, he read the Lotus Sutra, considered by the Nichiren sect to be the king of all Buddhist sutras, and found it disappointing, saying «it consisted of nothing more than simple tales about cause and effect». At the age of nineteen, he came across in his studies the story of the Chinese Zen master Yen-t’ou, who had been brutally murdered by bandits. Hakuin despaired over this story, as it showed that even a great monk could not be saved from a bloody death in this life. How then could he, just a simple monk, hope to be saved from the tortures of hell in the next life? He gave up his goal of becoming an enlightened monk, and not wanting to return home in shame, traveled around studying literature and poetry. While studying with the poet-monk Bao, he had an experience that put him back along the path of monasticism. He saw a number of books piled out in the temple courtyard, books from every school of Buddhism. Struck by the sight of all these volumes of literature, Hakuin prayed to the gods of the Dharma to help him choose a path. He then reached out and took a book; it was a collection of Zen stories from the Ming Dynasty. Inspired by this, he repented and dedicated himself to the practice of Zen. After leaving Eigan-ji, Hakuin met and studied with the teacher who would be most influential on his spiritual practice, Shoju. Shoju was an intensely demanding teacher, who hurled insults and blows at Hakuin, in an attempt to get him to reach satori. After several more experiences of enlightenment, Hakuin left Shoju after eight months of study. Though he never saw Shoju again, and the master would die thirteen years later, Hakuin would continue to think of Shoju as his «root master». After another several years of travel, and periods of spiritual sickness akin to kundalini, at age 31 Hakuin returned to Shoin-ji, the temple where he had been ordained. He was soon installed as abbot, a capacity in which he would serve for the next half-century. At age 41, he experienced a final and total experience of enlightenment, while reading the Lotus Sutra, the sutra that he had disregarded as a young student. He wrote of this experience, saying «suddenly I penetrated to the perfect, true, ultimate meaning of the Lotus». This event marked a turning point in Hakuin’s life. His total enlightenment finally achieved, he dedicated the rest of his life to helping others achieve kensho. He would spend the next forty years teaching at Shoin-ji, writing, and giving lectures. At first there were only a few monks there, but soon word spread, and Zen students began to come from all over the country to study with Hakuin. Eventually, an entire community of monks had built up in Hara and the surrounding areas, and Hakuin’s students numbered in the hundreds. He eventually would certify over eighty disciples to go out and teach Hakuin-style Zen. Hakuin died in Hara, the same village in which he was born and which he had transformed into a center of Zen teaching, at the age of 83. The most important and influential teaching of Hakuin was his emphasis on koan practice. Hakuin deeply believed that the most effective way for a student to achieve enlightenment was through extensive meditation on a koan. The psychological pressure and doubt that comes when one struggles with a koan is meant to create tension that leads to awakening. Hakuin called this the great doubt, writing, «At the bottom of great doubt lies great awakening. If you doubt fully, you will awaken fully». Only with incessant investigation of their koan will a student be able to become one with the koan, and attain enlightenment. Hakuin’s systematization of koan practice brought about a major revolution in Zen teaching. In the system developed by Hakuin and his followers, (it is unclear how much of the koan system in Hakuin Zen was developed by him personally) students would be assigned koans by their teacher and would meditate on them. Once they had broken through the great doubt, they would be tested by the teacher and given another koan. 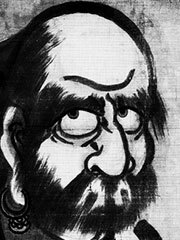 Hakuin’s main role in the development of this koan system was most likely the selection and creation of koans to be used. He originated what is probably the most famous koan in Zen, «What is the sound of one hand clapping?» as a substitute for the traditional first koan given to students, the Mu koan. He found this to be a much more effective koan at raising doubt in his students, and remarked that «its superiority to the former methods is like the difference between cloud and mud». One of Hakuin’s major teachings was to speak out against the sect of «Do-nothing Zen» teachers, who upon reaching enlightenment, devoted the rest of their life to, as he puts it, «passing day after day in a state of seated sleep». Hakuin believed that it was the duty of one who had achieved kensho to strive to assist others in the same goal. He told his students to never be satisfied with small attainments of enlightenment, and truly believed that enlightenment was possible for anybody to achieve if they exerted themselves and approached their koan with real energy. Much of Hakuin’s practice focused, as his teachings did, on zazen and koan practice. His motto was «meditation in the midst of activity is a billion times superior to meditation in stillness». Hakuin’s experiences of enlightenment seemed to come at unexpected moments, often when he was just walking or reading. One experience that he wrote about took place while he was walking through a torrential rain. As the water reached his knees, he suddenly realized the meaning of a particular verse that he had read earlier, and was seized by enlightenment. He had many such experiences, both large and small. Laughter was a large part of Hakuin’s reaction to his enlightenments, and he was known to burst into spontaneous laughter upon realizing the essence of a particular koan, causing those around him to believe him to be a madman. Hakuin’s early extreme exertions affected his health, and at one point in his young life he fell ill for almost two years, experiencing what would now probably be classified as a nervous breakdown by Western medicine, though the symptoms were similar to kundalini. He called it Zen sickness, and sought the advice of a Taoist hermit, who prescribed a chakra visualisation practice which eventually relieved his symptoms. Another important part of Hakuin’s practice of Zen was his painting and calligraphy. He seriously took up painting only late in his life, at almost age sixty, but is recognized as one of the greatest Japanese Zen painters. His paintings were meant to capture Zen values, serving as sorts of «visual sermons» that were extremely popular among the laypeople of the time, many of whom were illiterate. An extremely well-known and popular Zen master during his later life, Hakuin was a firm believer in bringing the wisdom of Zen to all people. Thanks to his upbringing as a commoner and his many travels around the country, he was able to relate to the rural population, and served as a sort of spiritual father to the people in the areas surrounding Shoin-ji. In fact, he turned down offers to serve in the great monasteries in Kyoto, preferring to stay at Shoin-ji. Most of his instruction to the common people focused on living a morally virtuous life. Showing a surprising broad-mindedness, his ethical teachings drew on elements from Confucianism, ancient Japanese traditions, and traditional Buddhist teachings. He also never sought to stop the rural population from observing non-Zen traditions, despite the seeming intolerance for other schools’ practices in his writings. Dumoulin, Heinrich. Zen: A Buddhism History. New York: MacMillan, 1990. Trevor Leggett, The Tiger’s Cave, ISBN 080482021X, contains the story of Hakuin’s illness. Waddell, Norman, trans. Wild Ivy, the Spiritual Autobiography of Zen Master Hakuin. By Hakuin Ekaku. Boston: Shambhala, 1999.